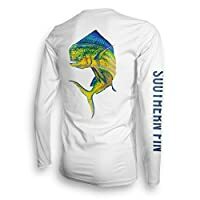 Whether you're headed out on the river, boat, lake or shore to cast your line, you don't want to interrupt the fun of fishing by having to frequently reach into your tackle box or bag. With the Anglatech Fly Fishing Vest, you can travel much lighter and always have your fishing gear within easy reach right on the front of your body. 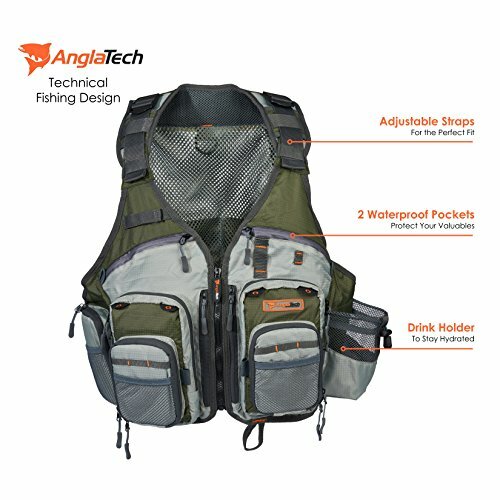 The Anglatech Fly Fishing Vest is a remarkably lightweight fishing vest that is designed to hold a maximum amount of gear. The fishing vest for women and men includes multiple pockets outfitted with cord zippers that open and close quickly and quietly. 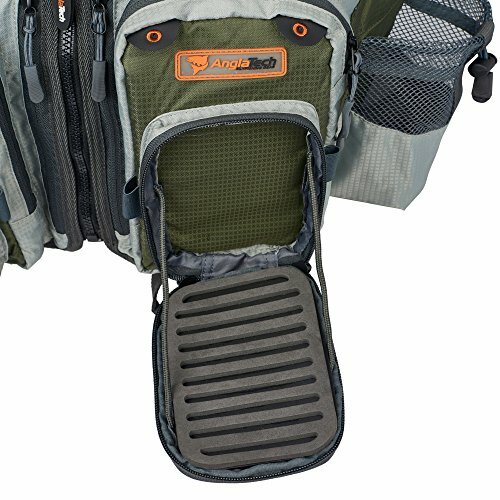 The large pockets in the fly fishing vest feature plastic buckles for connecting gear, and several of the small pockets open to reveal inner pouches for keeping gear organized. Mesh slip pockets on the outside of the fishing vest let you stow items that you may need in a hurry, and there are even extra pockets in the back. 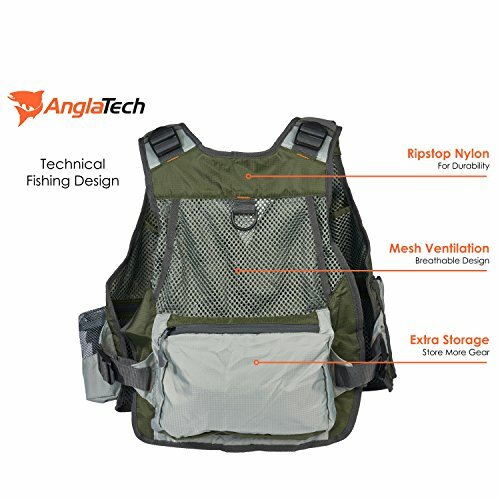 All in all, the Anglatech design gives you much more storage than ordinary fishing vests for men and women without added bulk or weight! Unlike other fishing vests, the Anglatech Fly Fishing Vest is truly made with comfort in mind. The fishing vest mesh back allows air to flow freely through the fabric, so that you stay cooler and drier even when temperatures climb. The vest evenly distributes the weight of your gear across your chest and shoulders, and it is cut to ensure that you can still fully move your arms. The fishing vest for women and men adjusts at the waist and on the shoulder straps, making it the perfect fit for virtually anyone. 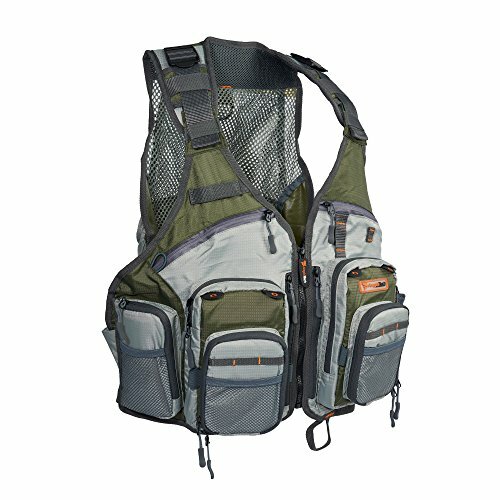 Plus, its olive green, gray and khaki design hides dirt to keep the fishing vest looking as good as it feels. Leave behind that heavy tackle box and keep all of your fishing gear right at your fingertips. See how easy it can be to keep your fishing supplies and tools neatly organized on every fishing trip! PLENTY OF STORAGE - Keep your fishing gear and equipment well-organized and quickly within reach. ADJUSTABLE SIZING - Adjustable shoulder and waist straps for the perfect fit. COMFORTABLE - Breathable mesh back allows for air to flow freely so you can stay cool and dry. LIGHT WEIGHT - Premium materials keep this vest small and light.